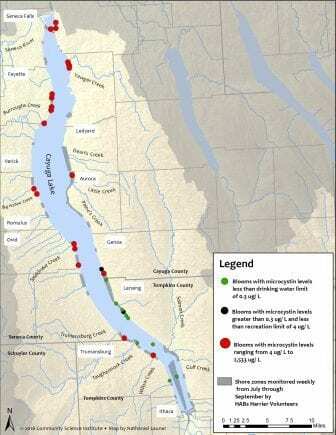 ITHACA, NY (WSKG) – Significantly more harmful algal blooms were reported on Cayuga Lake this year than in 2017. A local non-profit reports the 2018 blooms were more likely to contain toxins harmful humans and small mammals, like cats and dogs. 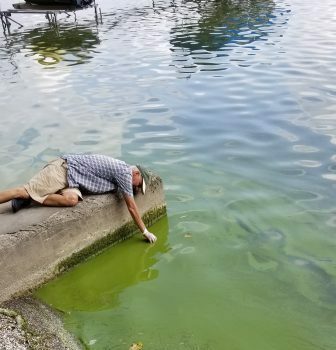 A volunteer monitor collecting a same from a harmful algal bloom on Cayuga Lake in summer, 2018. This is the first such Harmful Algal Blooms Monitoring Program report issued by the Ithaca-based Community Science Institute. Over the summer, the program trained 75 volunteers to monitor specific areas of the lake. Their findings were verified by the New York State Department of Environmental Conservation. The number of confirmed harmful algal blooms increased five-fold from 8 in 2017 to forty in 2018. Program coordinator Nathaniel Launer said this increase is only partly explained by better monitoring. Researchers also found more types of toxins that can affect the liver and cause illness. People or animals are exposed to the toxins through recreational activities or drinking contaminated water. “There was a clear trend towards blooms being more toxic,” Launer said. “In the later months of the summer — in August and September — than blooms that occurred in July and the earlier part of August. The Community Science Institute hosts a forum on Saturday, December 15, in Ithaca to explain their research.